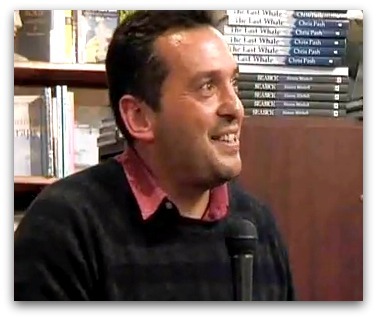 Author of The Slap Christos Tsiolkas (pictured) wrote to the ABC Board last Monday to plead the case for maintaining a stand-alone books program on Radio National. Currently the hour from 10am weekdays is devoted to literary culture, with The Book Show followed by a book reading. ABC management plans to fold this content into a one hour general arts program with the working title Arts and Books. Station manager Michael Mason is correct with his reply that 'the current management team have in fact increased the coverage given to books and writing'. There will be more discussion of books in general non-specialist programs such as Radio National Breakfast, which is having its airtime increased by half an hour each weekday, and the new Radio National Drive. But Tsiolkas' point is that the daily stand-alone literary show we are losing 'is vital to the health of literary culture here in Australia'. The key word is 'stand-alone'. It refers to the segmentation of programs according to particular specialisations or disciplines. In the past, this has enabled the intellectual rigour that has been Radio National's point of difference. Each discipline offers a different way of looking at the world, and isolating one from others allows us to reach a greater depth of understanding. A specialist program on religion — such as The Religion Report, which ended in 2008 — might talk about transubstantiation, but a religious discussion on a non-specialist program such as Radio National Breakfast would only speak about sacraments in general terms, or risk alienating the listener. Similarly The Book Show would discuss elements of literary theory, but its general Arts and Books replacement it is likely to simply refer to the existence of different literary theories. Michael Mason denies that the proposed changes signal a 'dumbing down' of Radio National. He stated in June that management is 'committed to retaining and improving specialisation', and insisted to Tsiolkas that 'the new draft schedule in fact increases the number of original specialist programs across more genres'. According to the draft schedule, two specialist programs lost in 2008 — The Religion Report and The Media Report — are returning. But it's hard to escape the impression that the drift is away from specialisation. It is reported that Background Briefing — the Sunday morning program that has specialised in investigative reporting for more than 30 years — is being folded into a live Sunday morning program titled Weekend Extra. Tsiolkas says that when he was growing up, he 'turned to the ABC for cultural inspiration and challenge'. The intellectual rigour of specialised programs can indeed be challenging, and for that reason many switch off. For the most part, radio is a medium that comforts rather than challenges. That is why the ratings belong to the shock jocks and other personalities who tell listeners what they want to hear and project a simple rather than complex world. Radio National has been the exception and, some would say, exceptional. Thanks for a timely comment on the very real dumbing down experience that is taking place on the ABC in general. It was never meant to rival the banality of so much of the commercial talk show mirroring of minimalistic 'opinions' of shock jocks. Thanks for this column, and for Eureka Street - much valued contributor to depth and insight. I have also been a great consumer of the specialist programs on Radio National. I did not have the chance of a university education and these programs have filled that gap for me over the years and continue to enlighten and enrich my life with knowledge. Generalized programs become just another talk back; if I want that I go ABC Local Radio. Thank you, thank you! I agree wholeheartedly. The ABC must remain a voice that speaks deeply on issues that affect us all. Programs on religion, politics and art, (whilst not necessarily listened to by the majority), are vital in informing that minority who still believe it is important for the private citizens of a nation to be well informed and educated on all things pertaining to genuine quality of life for us all. I am disappointed but not surprised with this ABC decision. Radio National program standards have been falling in recent years with the replacement of excellent presenters such as Peter Thompson (Breakfast), Julie McCrossin (Life Matters) and Sandy McCutcheon (Australia Talks). Hopefully people such as Phillip Adams, Ramona Koval, Andrew Ford, Robin Williams, Michael Cathcart, Alan Saunders, Rachel Cohn, Natasha Mitchell, Lucky Oceans and Paul Petran continue to present their programs. Radio and TV standards are generally appallingly bad with most of the mainstream media. The content of Local ABC radio stations such as 774 in Melbourne, ABC1 TV, ABC24 TV and all the commercial radio and TV is generally trivial and celebrity nonsense. The best radio and TV is provided by Radio National, community radio stations such as the Melbourne 3CR and channel 31. I would not say Radio National has been subject to dumbing down in recent times, though programs like the Religion Report are sorely missed by many. However, I agree with Christos Tsiolkas that the amalgamation of the Book Show with general arts programs is likely to be a mistake. I think there is a belief in RN management that specialist programs are on the way out, in favour of 'generalist' programs. Late Night Live, Life Matters and Breakfast are all 'generalist', whereas the Science Show, Encounter and the Book Show are 'specialist' (though not very specialist, considering the range of items within them). But if RN went all 'generalist', it would be the beginning of the end, for me. The very essence of the network is its ability to specialize in particular areas. Artworks should be kept, along with a dedicated Book Show. Amen to the preceding comments! The commentary programs on ABC are streets ahead, intellectually and in terms of reliability, of any radio - and most TV - alternatives. I hope that the Book Show remains a dedicated literary program. To be fair, though, when it began, it took me a while to get used to it as it took the place of an excellent Arts program whose exact name I forget. I was not alone in regretting its demise. (Martin Porteous, where are you these days? First rate arts reporter). If such a program were reintroduced it would be a tremendous plus.The RN Arts program on Monday afternoon is not in the same class. For the record, the book reading at 10.45 actually began life as part of Life Matters. Book Show presenters always 'sign off' before it. It could easily go to make more room for the substance of the preceding program. Return of the Religion Report is welcome news! I agree with your concerns. The Book Show format as is, is perfect. I regret not going online and airing my satisfaction. There is always more incentive to respond to complain. Ramona Koval's interviews are unmatched in combining wit and wisdom. The final 15 minutes of First Person reading are intriguing and Ramona's banter and handover to Bush Telegraph usually hooks me into listening on.